Yesterday evening started cloudy, with rain showers. As a result, I missed the splendid NLC display as seen from Belgium and the southern and eastern Netherlands. 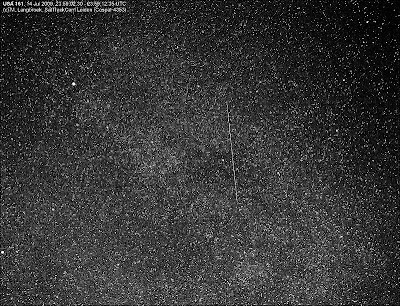 After midnight it cleared, and this allowed me to capture the Keyhole satellite USA 161 (01-044A) again. It was nicely on time. A bright mag. 0 stray, which turned out to be the Russian r/b 84-072B, made a similar trajectory 3 minutes earlier. Below image shows the Keyhole (01-044A) crossing the Milky Way in central Cygnus (I pushed the levels and contrasts of this image a bit in Photoshop to bring out the Milky Way better).